Visitation of the Blessed Virgin Mary - My Catholic Life! Only in the Catholic Church would a Feast Day first celebrated in the thirteenth century be considered “new.” But that is when the Visitation first appeared in some liturgical calendars. Our oldest liturgical feasts date from the apostolic period. That is, they were likely celebrated by the Apostles themselves in the years immediately following the earthly life of Christ. The original historical events of Holy Thursday, Good Friday, and Easter Sunday transformed into liturgical events so rapidly and so naturally that the earliest Christian writings are of a liturgical nature. Other Feast Days, such as Christmas, Mary the Mother of God, and the Birth of John the Baptist had to wait their turn. They are ancient but cede pride of place to the foundational events of Holy Week, just as America’s Presidents’ Day must cede to the more essential Independence Day. Without a country, there would no presidents, and without a death and resurrection, there would be no Christianity or Christian calendar in the first place. The Visitation falls, liturgically, when it happened historically. Mary conceived Jesus Christ in late March. Saint John the Baptist was born in late June. And it was between these two bookends that pregnant Mary visited her pregnant cousin Elizabeth. Perhaps it was in late May. We may be surprised in heaven to discover that many of our biblically based feast days are commemorated on the exact historical dates they occurred. Would God deceive us otherwise? After all, no good father would tell the family to celebrate his son’s birthday on a date other than when he was born. It is the Gospel of Saint Luke that recounts for us so many details of Mary’s life that otherwise remain untold. Saint John writes at the end of his Gospel that Jesus did and said many other things which are not written down. Perhaps the same could be said of Mary. Many words were spoken, gestures made, and events transpired, yet so much remains a mystery. Yet if we knew all that there was to know about God and the things of God, then heaven would be a bore and not be heaven at all. 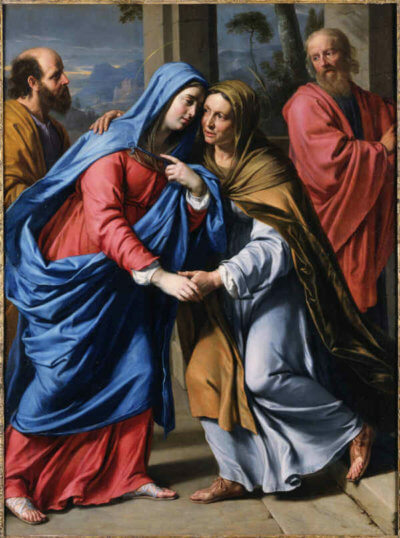 The Visitation is the first time that Mary publicly exercises her role as Mediator of the Son of God. God chose not only to become a man but to become such in the same way that all men do, through gestation and birth, with His virginal conception the sole miracle. Catholicism is a religion that believes in secondary causality. God directly intervenes in creation only rarely, instead inviting His creatures to perfect His raw creation by using their God-given talents. God did not cure the cancer. The skilled surgeon removed the tumor. He used the gifts God gave him. It was not a direct intervention. It was not a miracle. It was the doctor’s mind and hands being put to their highest use. Mary generously accepted to mediate the Incarnation, placing her body at God’s disposition. She, the Mother of the Church, carries the entire Church in her womb. She, the Ark of the Covenant, houses a treasure more precious than Moses’ stone tablets of old. And she, the Morning Star, shines in the blackness before the blazing sun rises in the east, dawning a new day. Christ’s presence in Mary’s womb radiates outward with x-ray power and reverberates in the words and gestures of faith which arise from Elizabeth and her child, John. Jesus’ cousin leaps for joy inside his mother. 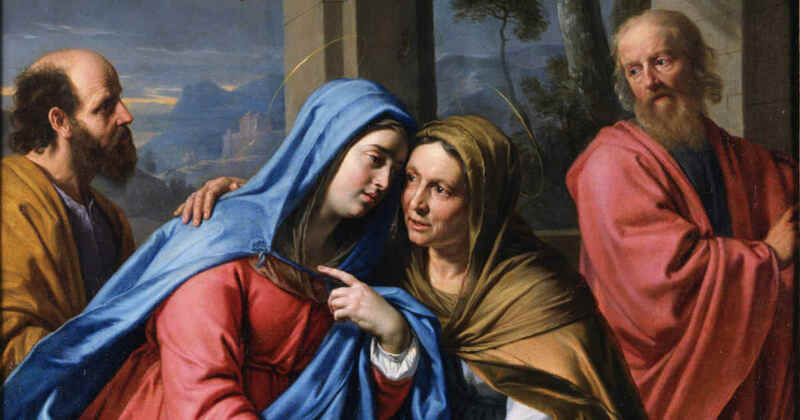 And Elizabeth reacts by speaking those graceful words, which countless voices will go on to pray, in countless languages, many billions of times in the centuries since and in the ages to come: “Blessed are you among women, and Blessed is the fruit of thy womb.” The Visitation is one of the sources of the Hail Mary. Elizabeth is a prophet. We are her hearers. For a prophecy to be a prophecy, it has to become true. Elizabeth’s words were true and are true. Mary is indeed blessed among women, and her fruit has indeed changed the world. Mary’s humility instinctively deflects. She praises the source of all goodness, God, rather than the goodness of her own generosity. All things, save evil, can be traced back to God. Mary is at the head of the trail in clearing the tangled path overgrown since the sin of Eve. With mankind close behind, Mary leads us back to discover anew the source of all truth, goodness, and beauty. Mary and Elizabeth, your generosity in cooperating with God’s will initiated the events of the New Testament. May we be equally generous in cooperating with God’s plans for our lives, knowing the beginning but not the end, lighting a fire that warms the lives of unknown others.